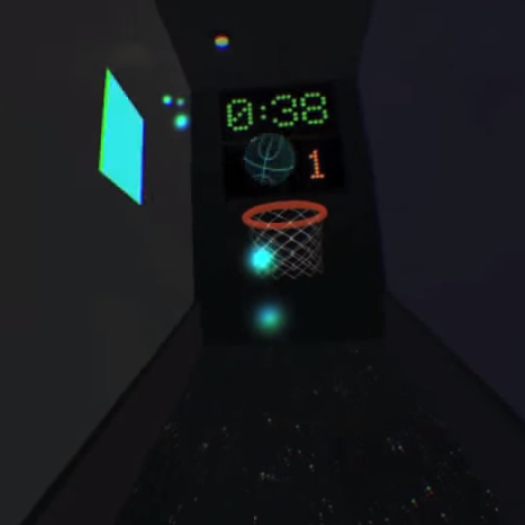 AstroHoops VR is an arcade-style basketball hoops game using Leap Motion and Oculus Rift DK2 (runtime 0.6.0.1), built in Unity3D. Push down the lever on the right to start the blacklight extravaganza. Place either your left or right palm closely over a basketball to pick it up. To throw the ball, thrust your palm away from you. The harder you throw, the faster the ball will go. 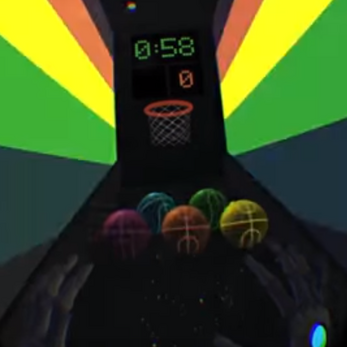 The moment your hand slows down, the ball will release. Snapping your wrist at the end of your thrust will also release the ball and provide some spin. Keep in mind the interaction zone of the Leap Motion. 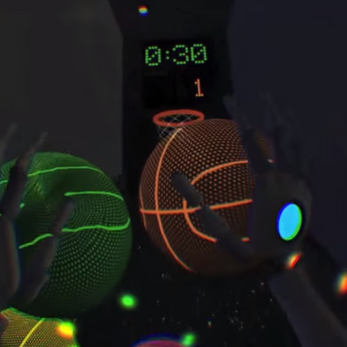 Short, straight thrusts in front of the Leap Motion controller produce the best results. 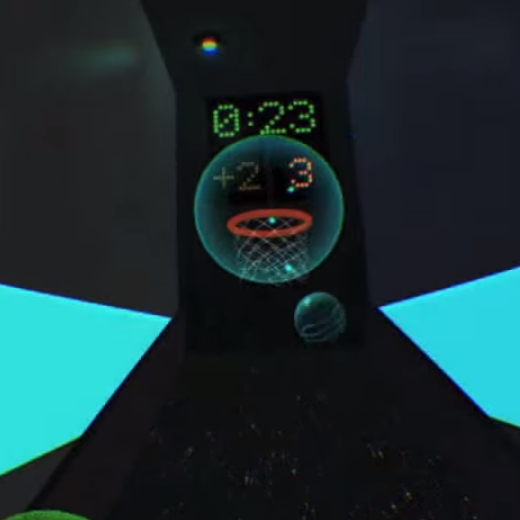 Making a straight shot is 1 point, while bouncing the ball off of the side walls to make a shot is 2 points. Check out the video attached to this page to see a demonstration. Have fun and feedback is welcome! Download the zip file provided for Windows and unzip it. Make sure that the Oculus Rift DK2 and Leap Motion are plugged in and turned on, and that the drivers for each device are installed. 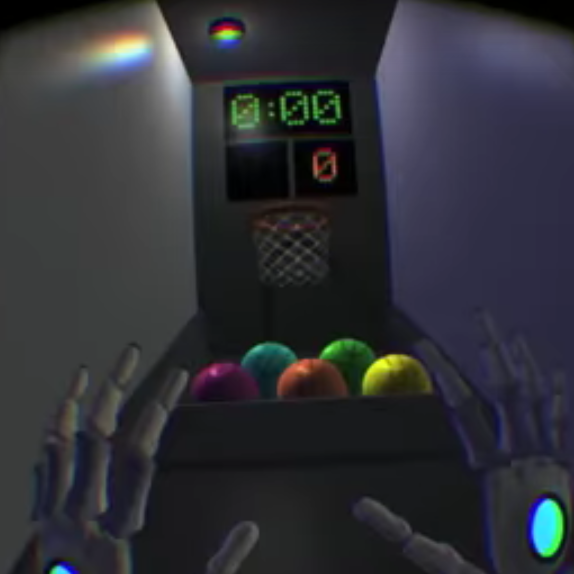 Run the ArcadeHoopsVR.exe or the ArcadeHoopsVR_DirectToRift.exe to start the game. Adjust the Oculus Rift positional tracker height and distance from your body until the view feels comfortable. I recommend the height be somewhere near your upper torso and placed at least 3-4 feet (or about 1 meter) in front of you. This game was developed using the Oculus 0.6.0.1 SDK and has not been tested on later runtime versions. This app will not output to the Rift with Oculus runtimes 0.7 or 0.8 installed. Thanks for the heads up. I wish I could fix this but currently the 0.7 and 0.8 SDKs won't run on my dev computer (no Bootcamp support).